Elegant design enhanced energy performance and exceptional value manufactured exclusively for ABC Supply Co., Inc. Lifetime warranty includes an accidental glass breakage. Multi-Chambered I-Beam structural mainframe provides superior strength and rigidity while offering the most adaptability for all installation methods. Low-profile tilt latches sit subtly out of view but easily engage when sashes need to be tilted in for cleaning. Dual Function partitioned sloped sill forms a negative pressure pocket that keeps sashes securely in place and water flowing away from your home, even in the most adverse weather conditions. Biomaxx advanced composite locks and keepers are 50% stronger than typical die-cast hardware while remaining lead-free, color-true without fading, warping or chipping. Full balance covers hide internal systems while eliminating unsightly visible sash stops. 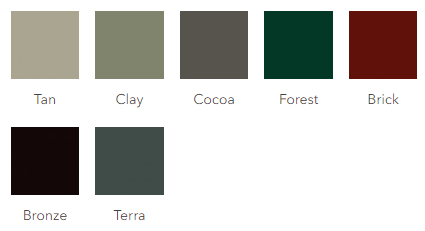 Customize your home by selecting a vinyl color that complements its style and look. Optional decorative exterior paint finishes create the perfect curb appeal. Thank you for contacting Gateway Brothers Construction Inc., a representative will contact you shortly.